GN has provided a customized solution to handle the drilled cuttings off the shakers for a drilling project from Pertanima, an Indonesian state-owned oil and natural gas corporation. GN after-sales engineers went there for the field service. The solution mainly consists of a Hi G cuttings dryer shaker and a Variable Speed decanter centrifuge to treat the water based drilling fluids waste. GNZS853 Hi G cuttings dryer vibration force can be up to 8.0 G. With a screen area of 3.2 square meters, the cuttings can stay longer on the screen for trapping the solids and the cuttings off it are dry enough for transportation. For oil based mud (OBM), we have vertical cuttings dryer to dry the drilled solids and big bowl oilfield decanter centrifuge for bentonite recovery. Pertamina is an Indonesian state-owned oil and natural gas corporation based in Jakarta. It was created in August 1968 by the merger of Pertamin (established 1961) and Permina (established 1957). Pertamina is the world's largest producer and exporter of Liquefied Natural Gas (LNG). GN Solids Control has set up her third new factory near Beijing after the original factory in Tangshan and shaker screen factory in Anping. The new job site takes up an area of 40,000 square metres with workshop equipped with new advanced equipment, and new techniques have been utilized in the production and quanlity control sections. The factory has been certified by the API & ISO standards, thus laying a good foundation for expanding the product range and production capacity. 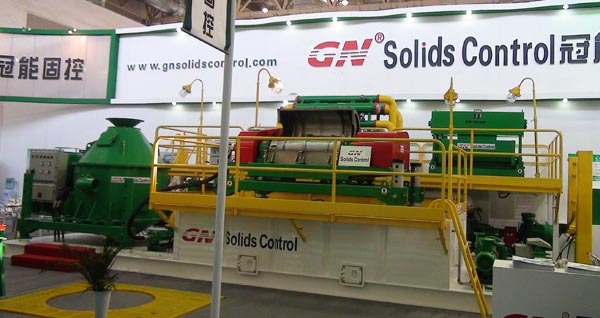 Up to now, GN Solids Control has always been dedicated in the manufacture and sales of solids control equipment & mud circulation systems. Every month we have large demand on decanter centrifuge, shale shaker and shaker screens, vertical cutting dryer ect. Despite the oilfied solids control system, GN also do well in compact mud recycling unit for Horizontal Directional Drilling and CBM induries. CPP, the largest HDD company in China has bought over 30 set of the mud recycling unit. In Australia and Newzealand, we also exported over 20 units. We are and always will be providing you the best solids and liquid separation solutions. GN will participate in AOG 2011 (Argentina Oil & Gas Expo 2011), This is the 2nd step for GN to explore our market in Latin America. We just came back from Brazil Offshore 2011 last month. Show Time: 10th to 13th Otc 2011,14:00~21:00 p.m.
GN attend this show together with our Exclusive Agent in Argentina , pls check their contact information. English, Spanish, Portuguese are all welcomed.